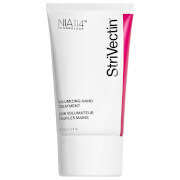 This product is an anti-aging cream that moisturizes, conditions and protects hands and nails. This formula helps to reduce the appearance of fine lines and improves skin tone, along with SPF 15 broad spectrum UV protection. This hand cream also helps fade age spots with a lightening complex to even skin tone for younger looking, more radiant hands. Panthenol (Pro Vitamin B5), Shea Butter and Glycerin instantly soften and hydrate. Reduces the appearance of lines and age spots. Improves and enhances skin tone. Use with your daily moisturizing routine, apply liberally and massage into hands every day and night for maximum results. Aqua (Water, Eau), C12-15 Alkyl Benzoate, Glycerin, Butyrospermum Parkii (Shea) Butter, C18-36 Acid Glycol Ester, Glyceryl Stearate, Cetearyl Alcohol, PEG-100 Stearate, Cyclopentasiloxane, Dimethicone, Polyacrylamide, Cyclohexasiloxane, Phenoxyethanol, Tocopheryl Acetate, C13-14 Isoparaffin, Butylene Glycol, Panthenol, Methylparaben, Parfum (Fragrance), Ethylparaben, Dimethiconol, Acrylates/Vinyl Isodecanoate Crosspolymer, Laureth-7, Phytantriol, Undecylenoyl Phenylalanine, Dipropylene Glycol, Potassium Sorbate, Tetrasodium EDTA, Potassium Hydroxide, Lupinus Albus Seed Extract, Carbomer, Agarum Cribrosum, Polysorbate 20, BHT, Butylparaben, Propylparaben, Palmitoyl Oligopeptide, Isobutylparaben, Palmitoyl Tetrapeptide-7. I started using Boots No.7 products in January of 2014. I have younger looking hands now than I did in my 30's. I had several pre skin cancers removed from my hands leaving them, needless to say a little unsightly. As of this moment I can barely see the places, soft to the touch and my hands seem to be firmer than ever. I would recommend this hand cream because it's never too late to turn back the clock even just a little!